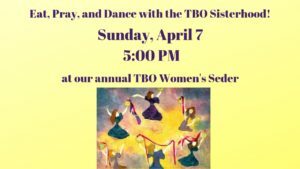 Women’s Seder Eat, Pray, and Dance with TBO Sisterhood on Sunday, April 7, at 5:00 PM. Open to all women and girls ages 13 and older. $35 for TBO members; $54 for guests. To bring a dish, click here. To RSVP, click here. This entry was posted in Uncategorized on March 24, 2019 by Kim Lefferts.